Among Indiana’s common household “invaders” are millipedes, sowbugs, and pillbugs. None of them are true insects, but they belong to closely related groups. 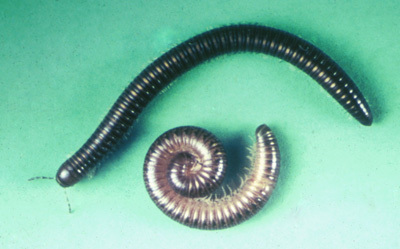 Millipedes have two pairs of short legs on each body segment. There are many species of millipedes, but the ones that commonly invade homes are usually 1/2 to 1-1/2 inches long, gray or brown, and curl up when disturbed. 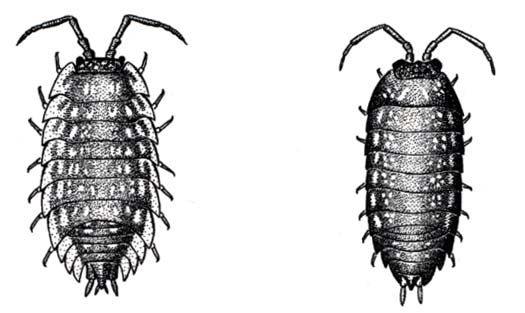 Sowbugs and pillbugs are gray, with flattened bodies and 7 pairs of legs. They range in length up to 1/2 inch. 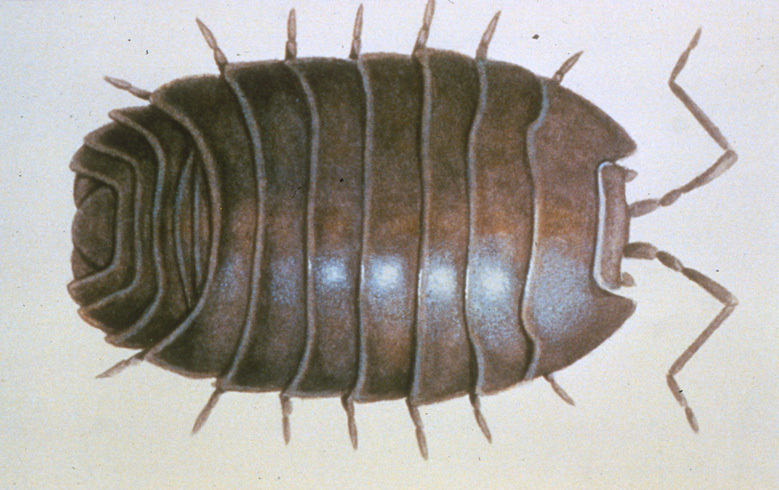 When disturbed, pillbugs can roll themselves into a ball, but sowbugs cannot. 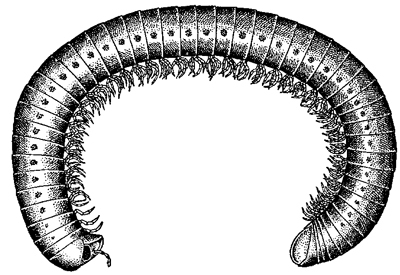 Millipedes, sowbugs, and pillbugs are scavengers, and their diet consists chiefly of decaying vegetative matter. These organisms are most commonly found in wooded areas, especially in ravines where there is plenty of damp leaf litter and other decaying vegetation. Compost piles, mulched areas, and damp basements with dirt floors are also likely abodes. Sometimes, millipedes, sowbugs, and pillbugs leave their natural habitats, crawl about over lawns and sidewalks, and invade homes in large numbers. Large amounts of rainfall can trigger mass migrations of millipedes from the soil. At any one time or place, usually just one of these three is a problem. However, there may be occasions when two or all three are present at once. Although they cause little or no real damage, their presence is undesirable. Although the heaviest migrations usually come from nearby wooded areas, mowing lawn grass regularly and using herbicides to remove broadleaf weeds which serve as shelters help prevent invasions. Removing piles of rocks, boards, leaves, compost, and general refuse from around buildings will help reduce millipede, sowbug, and pillbug numbers. To keep these pests out of the home, foundation walls should be repaired, and any cracks around doors, basement windows, or similar openings should be sealed with caulking compound. In cases of severe and perennial infestation soils with high organic content immediately surrounding the foundation should be replaced. Some species of millipedes, sowbugs, and pillbugs are difficult to kill with any insecticide. Generally, however, insecticides, when properly applied, will give some control. Any of several synthetic pyrethroids are labelled for control around the outside perimeter. Select only formulations of these insecticides labelled for millipede, sowbug and pillbug control and follow label directions closely. Yard and garden products labelled for “crawling insect” control may also be used. Apply the spray to any infested area outdoors and as a barrier treatment on foundation walls and soil adjacent to the buildings. Use enough to thoroughly wet the surface being treated and any visible millipedes, sowbugs, or pillbugs. Repeat applications may be needed if these creatures continue to move in from surrounding areas. General indoor spraying to kill any of these is seldom recommended. Any millipedes, sowbugs, or pillbugs that are found indoors can be eliminated by hand collection, vacuuming, or otherwise sweeping them up, or by spraying them directly with a household spray containing pyrethrins. A household pest control product labelled for “crawling insect” control may also be used. Be safe! Before using any insecticide, read the label, follow directions, and observe precautions.